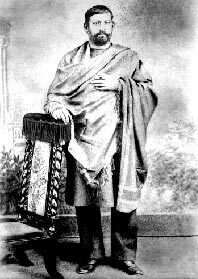 Photographs of people associated with Swami Vivekananda - Frank Parlato Jr.
Surendra Nath Mitra born 1850(?) D. May 25, 1890. Urged by Ramchandra Datta, Surendra went to Dakshineswar in the company of Datta and Manomohan Mitra to meet Sri Ramakrishna (?1880). Surendra paid most of the expenses for the food and bedding for devotees who served Ramakrishna at Dakshineswar, Shyampukur and Cossipore. He commissioned the oil painting in which Sri Ramakrishna points out to Keshab Chandra Sen the harmony of religions. After Ramakrishna's passing, Surendra paid the rent of the house at Baranagore that housed the first monastery of the disciples of Ramakrishna. When Belur Math was built, the marble flooring for the original shrine-room was installed with money that Surendra had set aside for the Math.